Ahhh…I LOVE organization!! I’m definitely not the most organized person, but that doesn’t stop me from loving it. I am forever working on getting more organized, and now that I’ve moved into a bigger house, I think I can finally achieve it…someday. It’s one day at a time, just organizing one little thing at a time. I’m a lover of the site Hometalk. I’ve done several media events for them and we’re friends. We like each other. This week they asked me to curate a board about organization and storage and I can’t wait to share it with you! If you are ever looking for inspiration for your house or have a question about decorating or remodeling or basically anything home related, Hometalk is your site! It’s a social media network for home and garden enthusiasts and as you might know, I am one major home and garden enthusiast! That’s my new career title–Official Home and Garden Enthusiast. 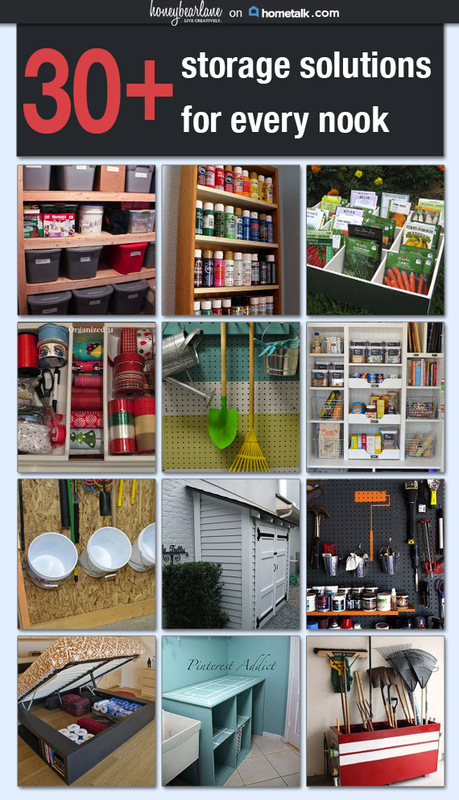 Click on this lovely picture to see my board of truly awesome organization and storage solutions or pin it for later! This is some great inspiration to help you get jump started to an Organized 2015! Happy organizing! Very cool storage ideas! I would love to try them at home! We are going to make a remodeling in the spring and I already gather ideas! Thanks!